A comprehensive review of Johne’s Disease (Paratuberculosis) guest edited by Dr. Michael Collins! Topics will include: epidemiology and economics, pathogenesis, treatment and chemoprophylaxis (monensin), genetic resistance, vaccination, diagnostic methods, control of paratuberculosis in beef cattle, control of paratuberculosis in dairy cattle, control of paratuberculosis in small ruminants, paratuberculosis in wildlife and zoological collections, food safety and zoonotic concerns, state and federal efforts at control, international efforts at paratuberculosis control, case studies, and more! 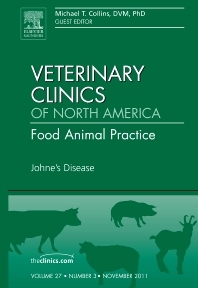 This issue covers a comprehensive review of Johne’s Disease (Paratuberculosis) guest edited by Dr. Michael Collins! Topics will include: epidemiology and economics, pathogenesis, treatment and chemoprophylaxis (monensin), genetic resistance, vaccination, diagnostic methods, control of paratuberculosis in beef cattle, control of paratuberculosis in dairy cattle, control of paratuberculosis in small ruminants, paratuberculosis in wildlife and zoological collections, food safety and zoonotic concerns, state and federal efforts at control, international efforts at paratuberculosis control, case studies, and more!